Hello Graveyard Rabbits. The Association has been receiving many questions regarding the meaning of symbols on headstones discovered by our members. Graveyard Rabbits are the most knowledgeable and generous group of people around. So, knowing that, we will be posing those questions to you, our members. Can you help solve the mystery? 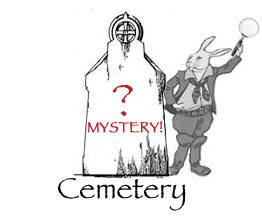 Robin Inge, The Graveyard Rabbit of Wichita County, Texas, brings us our first Mystery! If you have the answer please leave a comment below. GYRabbits, we're counting on you. What is in the Meaning of a Headstone? Have you ever thought about what is in the meaning of a headstone? I had not until recently. When I looked at it, I saw a marker telling me the date of birth and date of death and sometimes even date of marriage and the name of the individual(s). I never paid attention to the pictures of carvings on the stones. Recently a question was asked about two headstones found during a search. I found the stones interesting and inquired more about them. No one knew anything about the stones, and only a little information about the individuals and non of it matched the headstones. Information was provided stating that all census showed Mr. Brown was a farmer. He was born 7 Aug 1854 and died 15 April 1925 in Upshur County, Texas and buried at Simpsonville Cemetery. The cemetery is located about 11 miles Southwest of Pittsburg, Texas in a small town called Simpsonville, also known as, Thomas, Texas. Now the photo shows the marker to be in the shape of an ANVIL, which is a tool usually used for forging metal. The first Anvils were made from stone and the changed to bronze and then later to iron. The Anvil has evolved over time and the most primitive were made of simple block form. The first Anvil's were used by blacksmiths. 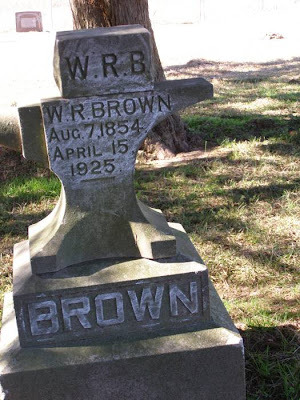 In the photo of W. R. Browns Headstone, you will see another small block laying on top of it. I believe that this piece may be the foot stone, but for some reason it has been placed on top of the actual headstone. Now this stone is a little more interesting in that there are no dates placed on this one. 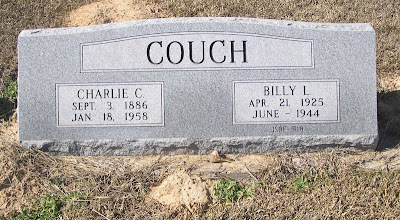 And it is actually separated from the actual headstone on Mr. Couch. 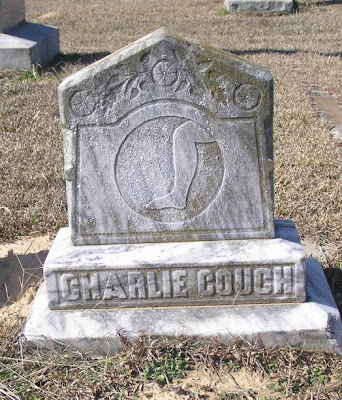 Charlies was born to J. Frank Couch of Georgia and Alice Elizabeth Wright of Texas. Charlie was born in Simpsonville, Texas on 3 September 1886 and died of heart failure on 11 January 1958 and worked as a grocer in the little town of Simpsonville. Now the death certificate shows that Charlie was cremated when he died. The strange thing about this stone is there is another stone located next to the Headstone with the carving of a leg, which to me looks like it is running maybe. Charlie is buried with his son Billy who died on July 1944. Charlies son Billy, served in the Air Force and and is listed as one of the men and women who are considered as MIA's from World War II. You can view information about Billy on the Upshur County website on TexGenWeb and it will give information regarding his service. After Charlie's son Billy died a headstone was erected and both of them now lay together. What is the mystery about these headstones? What is the meaning of them? I am hoping that someone can explain to me what the meaning of these particular stones are. For now Happy Hunting and see ya around next time. The gravestone with the leg is older than the death date of either man (1944 or 1958). Perhaps it is the grave of an older ancestor? BTW, the man name is Couch, right? fM you typed Counch. I looked in Gaylord Cooper's book, the AGS Guide #8 Symbolism and Sharon Carmack's guide and found no reference to an anvil or a leg. In Christian symbolism, the anvil is an attribute of St. Eligius (Eloy), the patron saint of blacksmiths. In early symbolism an articulated leg meant walk, run, or go. I did not find it associated with headstones, though. A possibility to consider is that he lost a leg and it was buried. We have a burial in Eastside Cemetery [Reno Co., KS] of a woman's leg. When she died she was buried in another lot. 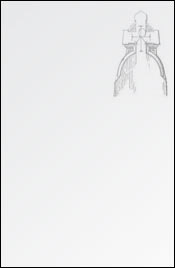 Douglas Keister's _Stories in Stone_ states "the human foot symbolizes humility and service since it touches the earth. The washing of feet was a common practice in biblical times. It is referred to in Luke 7...And at length in John 13." Forgot to add info about the anvil! (Also from Douglas Keister's book.) "The anvil symbolizes the primordial forging of the universe. It is an attribute of the storm and thunder gods Vulcan (Roman) and Thor (Norse)." He also adds what fM stated about the Christian symbolism. It wasn't uncommon for an individual to have a limb buried after it was amputated, which builds on the belief of a resurrection during the last coming when the body would be remade whole. Presumably by burying the limb you'd know where it was. Regarding the anvil - they're also commonly used by another type of metal worker, a farrier. It's very possible in a small community that a person would list their occupation as "farmer" even though they also provided blacksmith and/or farrier services to the community. My grandfather shoed horses (farrier work) and sharpened and repaired tools (blacksmith work) but listed his occupation as "farmer" or "teacher" depending on census year (he taught high school as well). thanks for all the information. Now that I have read all this, I am starting to put some pieces together. Although there are many symbolic headstones, which represent profession, there are very few blacksmiths who would use this as a headstone, especially in 1925. It would have seemed quite strange to most people at the time. Although today we try to show individuality in our choice of headstones, I don't believe it was common for that time in small community. My guess is that the footstone, now placed on top of the headstone, is probably older and marked the resting place, until the headstone was erected. As for the Anvil: Especially in the USA/England in the 1920s, heavy industry was connected with signs of modernity and hope. As such the anvil could represent strength and the promise of a brighter future.